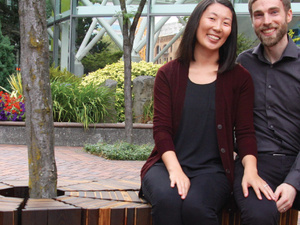 Come listen to a husband-and-wife design team about the inspiration and production of their prize-winning bench, A Quiet Place to Sit and Rest. A seemingly radical idea: saving the world’s flora, starting with one tree in downtown Portland. This was the vision that drove the design by Alyssa and Kyle Trulen for their bench for the Street Seats design competition. Their inspiration came from the beloved children’s book, The Giving Tree by Shel Silverstein. Trees provide economic, social, cultural and physical benefits to all living creatures, but urban trees in particular often face a lack of care and attention that can be deadly for them. The Trulens thus decided to create a bench that could protect urban trees. The team used thermally modified wood to create a concentric ring design that protects trees from threats like soil compaction and bark damage. This bench represents a hope of a healthier urban environment for both people and trees. Alyssa is a communications manager and editor with degrees in business and communications. Kyle is a dual-degree landscape architect at Lango Hansen with project experience across the U.S., Europe, Asia and Africa.